Why Use Display Boards for Exhibitions? If you are attending an exhibition or trade show then using display boards for your marketing message might not be top of your list of equipment to use. However, display boards are a versatile, lightweight and easy to use display system and we believe they are worth considering for your next exhibition. These portable display solutions are the ultimate marketing ‘go to’ products that can be used time and time again. Display boards can be used in different ways depending on your requirements. All our boards are double sided giving you a maximum visibility area – ideal if your stand will be approached from both sides. Folding display boards can be set at an angle to fit the space you have available. Our panel and pole kits offer ultimate flexibility as they can be assembled in various configurations depending on space and your exhibition stand requirements. The panels can be mounted in a landscape or portrait position and posts can be angled to create numerous shapes including curve, zig zag or a straight line. You can use your imagination and create a stunning display with your all important marketing messages on that will get you noticed- an excellent choice for art exhibitions and photography events where you may want to showcase your work in a unique way. Our folding display boards are our most popular range of display boards ranging from our smaller display boards, junior and senior table top displays to our 8 panel folding display board. These folding display boards can be set at an angle to maximise the space you have available. Both our PVC Folding Display Boards and our Aluminium Folding Display Boards come with the option of adding a header for additional branding. Display boards are incredibly versatile and they can fulfil any display requirement for almost any environment. They are ideal for promoting your product or service at exhibitions and trade shows. They can also be used for showcasing information in offices, schools, public buildings, reception areas, retail environments, craft fairs, surgeries and transport hubs. They provide you with a blank space which allows you to display any information that you wish. From marketing messages at a trade show, to internal information in the staff room. The possibilities are endless. The fabric display panels are Velcro-friendly which makes them easy to attach your promotional material to. We also offer a range of pinnable screens which are compatible with pins or Velcro. Each display panel has a recess on one side so that graphics can remain in place even when stored, making it easier for the next event in your calendar. Display boards provide a large, freestanding display area. If you are attending a show or exhibition and you don’t have a shell scheme in place, our display kits allow you to configure your own exhibition space, making your stand unique to your needs. Our prices start from just £57 for a table top display board. Meaning that they are excellent value for money, very effective and will prove to be an essential addition to your exhibition stand equipment. Some exhibition equipment can be bulky and even though it is advertised as ‘portable’ it is heavy and difficult to store and transport. However, our display board kits really are lightweight and easy to carry. 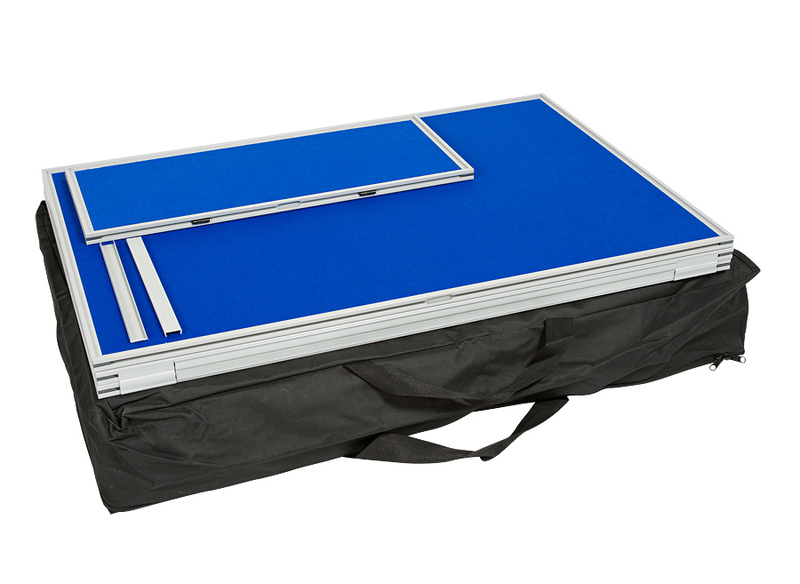 For example our 6 panel folding display board with header panel weighs approx 9kgs – a manageable weight for one person. Our kits also come with a carry bag as standard so they are easy to carry and display panels are protected during transport and when stored. There are so many options to choose from including table top or freestanding boards. You can choose the number of panels you use, the fabric colour and frame type. With such a choice available we feel confident we can provide you with a display board system that is unique to your needs, and that will fulfil all your exhibition requirements. We offer a range of different styles of display boards. Our PVC folding display boards are available in 6, 7 and 8 panel boards and also 2 table top sizes. Our lightweight aluminium folding display boards also come with 6, 7 and 8 panel kits as well as the standard tabletop display boards. The modular range of exhibition display boards is based on a panel and pole modular display board system and is our most versatile display board system. It gives you the ability to purchase the system components separately offering you a flexible display which can vary in size from exhibition to exhibition. All four designs of boards are upholstered using loop nylon, which accepts velcro, and offer a double sided display area. Our larger jumbo display boards and mobile concertina screens can also be used as room dividers or office partition screens. Our folding display boards are hinged in two sections which simply unfold and clip together. The panel and pole display boards come in kit form and clips are used to attach display panels to the poles which means they can be set at any angle and at any height position on the pole. No tools are required for our display board kits and they can easily be assembled by one person in minutes, making them an ideal choice for exhibitions. Display boards are an ideal choice if your company changes its marketing message regularly. The display material is not permanently fixed to the boards and allows you to change your display time and time again without any further costs to your exhibition equipment. -We are the leading manufacturer and retailer of display boards providing you with the best industry knowledge and products. -We only use the best quality materials; deep pile loop nylon, thick honeycomb board and assisted with a zip carry bag as standard providing you with durable well made display boards. -We also include an extensive 5 year warranty. If you have an event coming up and you are not sure of what exhibition material is right for you, call our sales team on 01733 511030 for assistance in choosing the right display option.